Breezway custom manufactures each of your orders. With a vast range of customising features, quoting and ordering can be daunting. To make this easier and faster we have some helpful tools and people available to assist you. BOB Online is our online quoting and ordering software that can be made available to you. The software gives you the option to manage your own quoting and order placement. This way you can gain instant feedback on pricing and be able to respond to your customers, as you choose. BOB is available to all window fabricators. Please contact your Distributor or Breezway to discuss this further. Please visit our training videos for detailed information on how to use BOB Online or Login below. Our cut-off for same day order entry is 12.00pm (Australian EST). This is subject to any peak loads and of course orders having clear and complete information. It is advisable to send your orders the afternoon before or early in the morning to allow time for any clarification of the order details and order entry. To achieve our short lead times, orders commence production throughout the day. Each process – cut, paint, assembly, packaging and despatch is scheduled over the lead time that has been allocated to your order. Once the order has commenced production it will be too late to make changes to the order without costs being incurred. Breezway also offers customers the alternative to have new orders placed on Order Review Block. We will enter the order in our system but prevent it from entering the production run into the factory. This is attractive for customers that want some time to review the order and potentially make any changes. Once the customer communicates that the order is ready to proceed we will send a final Order Confirmation, apply a despatch date and commence production. After the order is entered we will send you an Order Confirmation. Checking your Order Confirmation will ensure we have interpreted your order as you intended and avoid the subsequent problems and costs that result from an incorrect order. Remember to check details such as sizes, features, colour, pricing, ship to address, the method of transport and the despatch date. Please contact us immediately should you identify any discrepancies. If you need to change your freight method, please email this to us in writing. Your Order Confirmation will have a despatch date. Please note that this is Ex-Brisbane and you will need to make allowances for transport time to your destination. In unforeseen circumstances where your order will be delayed, you will be notified by email or telephone as soon as possible. Please check that the goods have arrived correct and in full. If there are any discrepancies, please notify us within 7 days of receiving the goods. Your packages will also contain a delivery docket which identifies the contents of each parcel. On these you will find our Sales Order reference number, the item type and quantity. Please make sure you check the packaging on all parcels. Should damage occur during transport, you will need to lodge a claim with your nominated carrier. Or contact your Customer Service Consultant if the delivery has been managed by Breezway. Your invoice will be emailed to you once the goods have been dispatched. The items that appear on your invoice reflect your purchase order and list each item individually, including the required quantity, unit price and total price. 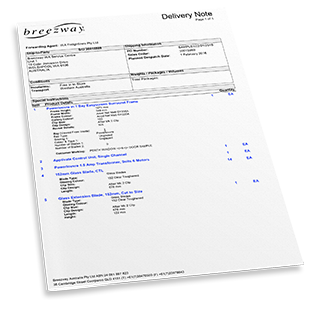 In situations where ‘back-orders’ are required, the invoices will reflect each delivery. This means that in some instances, you may see more than one invoice per purchase order. All invoices are payable within 30 days of the end of the month after the invoiced date. If you have any queries relating to your invoice, please contact our Accounts Receivable department. 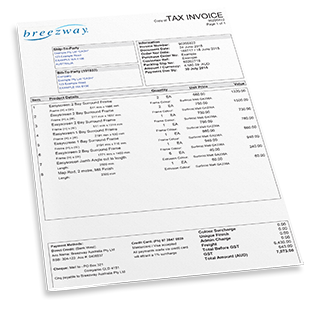 Breezway has many resources in place to assist you with purchasing and using our products. Please contact us with any questions or suggestions. At times you may choose to use a more manual quoting and ordering method instead of BOB Online. The Excel forms below (format is .xlxs 2007+) will help to ensure all the details required to clearly request your quote or order have been included. Please use the drop down menu in each column to easily customise your quote or order. To download simply click on the highlighted links below, or Ctrl click if on a Mac, and select Save Link As. PDF versions of the quote and order forms are also available below. Please Note: These PDF forms are in a basic format and do not have drop down menus available for quick and easy product customisation. 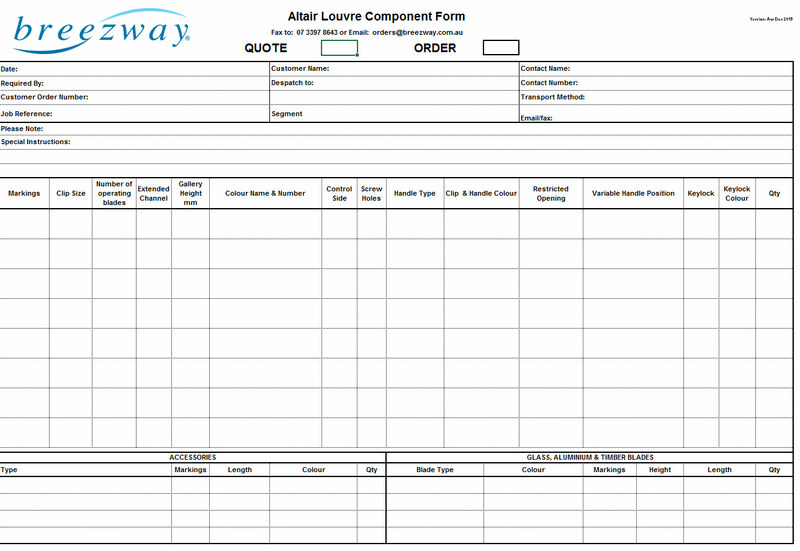 To view Sample Component Form click on image above. To view Sample Surround Frame Form click on image above. Please download the PDF below to view a copy of the Terms & Conditions of Sale effective 1st April 2019. Breezway has a friendly Sales Team available to answer all your enquiries and offer after sales support when you need it. 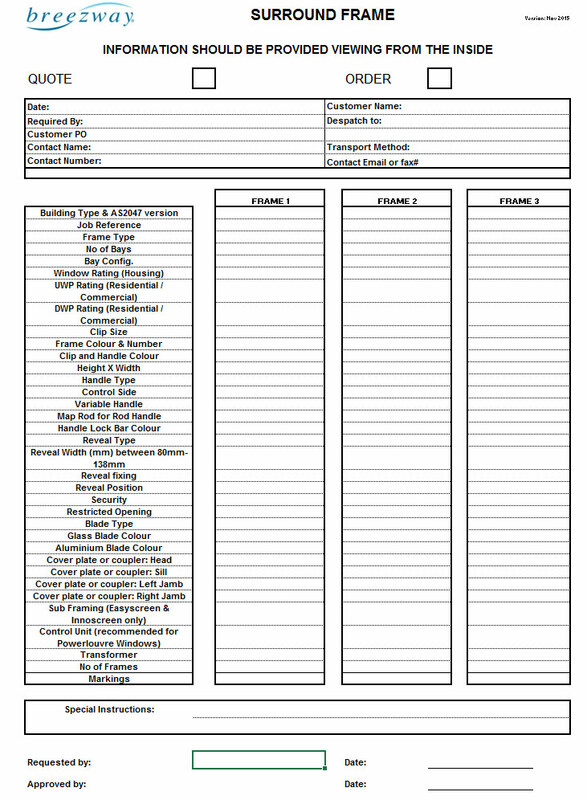 Please download and fill in the PDF form below for all after sales service requests. Please contact our Breezway Customer Service Team on 1800 777 758 between 8am and 5pm to assist with your quote and order enquiries or use the Contact Form.